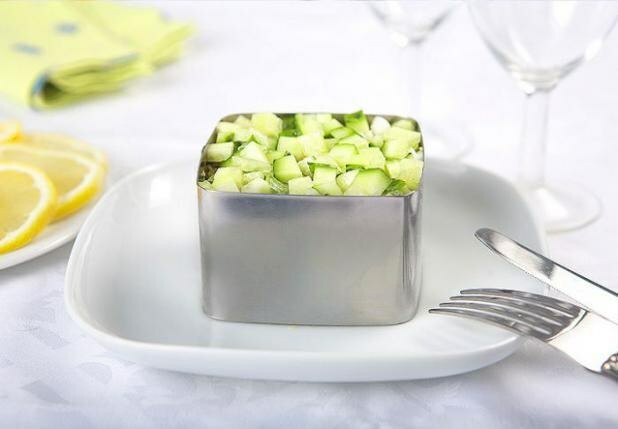 Skilful hostess often think about preparing a beautiful and original salads, which is quite difficult to give a rectangular, square or circular in shape. To achieve the desired configuration of the salad, you need to use improvised means in plain boxes, plastic bottles or cans of canned food. First you need to determine the form that will have a salad. To give the outlines of the square or rectangle you can use leftover cake, or other products, pre-cut out of her bottom. The inner walls of the box neatly vystelite cling film or foil, after which a pipe shape is installed on the dish and filled with salad. Then one side of the shape cut with sharp scissors and gently remove it from the salad that it remains only to trim and decorate as desired. For the preparation of salads is not recommended to use many dressings or mayonnaise, as they will spread. To give the salad a round shape and low height, you can use a canning jar, jar from-under canned corn/peas or plain plastic bottle. You have selected the shape you need to trim the top and bottom, leaving the middle of the desired height, which is then filled with salad. If you want you can cut from another bottle with a cone top to give the salad shape of a Christmas tree. The salad in the shape of hearts, stars or other non-standard objects can be done using foil. To create the layered salad put the salad in the oval dish, alternating layers of vertical walls of rigid cardboard, which are then carefully removed. This method is ideal for putting some salad in the form of any animal, for example, the symbol of the coming year. It need animal drawing, cutting Board, light flat dish and plastic wrap. The ingredients for this salad depends solely on prescription. First you need to print the drawing to redraw it on paper and cut out, given the size of the picture that should be placed on the dish for the salad. The prepared mold is placed on a cutting Board and cover with cling film, with tucked under the Board it ends. On the film along the contour of the pattern lay out salad a lot. The entire salad, which turned out the outline of the drawing, neatly cleaned and covered with a flat salad dish, trying not to squeeze him too hard, otherwise the shape of the lettuce will spread. To give this salad is great form small, flat tool like a spatula. Then the salad should be carefully and quickly flip the dish up, remove it to a Board, tape and picture to touch up the edge and decorate the outline of the "face" of the selected animal.